The University of Central Missouri’s Politics and Social Justice Week is a week-and-a-half long collection of events and presentations, focused on a number of political and social issues ranging from North Korean propaganda, to judicial activism, to race and policing. This year’s series of events started Monday evening with a presentation by Dr. Kenneth Cust on the precise definition of social justice, and the week will conclude April 8 with the Oxfam Hunger Banquet. Robynn Khulmann, assistant professor of political science, considers social justice an umbrella term, and underneath that heading includes many perspectives. Social justice is defined by the National Association of Social Workers as “the view that everyone deserves equal economic, political and social rights and opportunities.” Gregory Streich, professor of political science, explained how conversations on particular social justice issues have many manifestations, often shaped by political affiliation. Streich said the week is more about opening up discussions on political topics, instead of pushing an agenda. The selection of diverse topics for Politics and Social Justice Week is a result of a student initiative led by UCM’s chapter of Students For Political Action, a non-partisan organization. The start of the selection process began with brainstorming and selecting a theme, then local- and regional-based speakers were contacted. Some of the speakers are from within the UCM community, and others are from outside of the university. “Students hear from us in class all the time on topics like immigration or judicial activism, but I think it’s also important for students to hear from other academics or experts in their field,” Streich said. Streich said issues of social justice include both a global dynamic and local dynamic. The works of Reza Aslan, this year’s keynote speaker, fall within that global dynamic. “I think as far as globally, I think he is a very well-known speaker, writer, and author on the topic of religion, culture, and globalization,” Streich said. Aslan is an Iranian-born theologian, author and professor of creative writing at the University of California Riverside, who holds degrees from Harvard, University of Santa Clara, University of California, Santa Barbara and the University of Iowa. His books include “Zealot: the Life and Times of Jesus of Nazareth,” “No God But God: The Origins, Evolution, and Future of Islam,” and “Beyond Fundamentalism: Confronting Religious Extremism in a Globalized Age.” He is scheduled to speak on the topic of “Bringing Together a World Divided “ Thursday in the Nahm Auditorium, W.C. Morris 299. Streich said Aslan’s presentation could tie together themes of religious extremism and conflict along with a juxtaposition regarding the role of religion in social justice movements. A theological perspective related to politics and social justice is just one topic to be presented during the week. Streich said he likes seeing an interdisciplinary overlap with the events. He noted that other departments outside of political science are also a part of Politics and Social Justice Week, noting education and criminal justice. Liz Wood, a senior communication studies major at UCM, said that the week is an opportunity for various departments to display a global impact related to their respective fields. 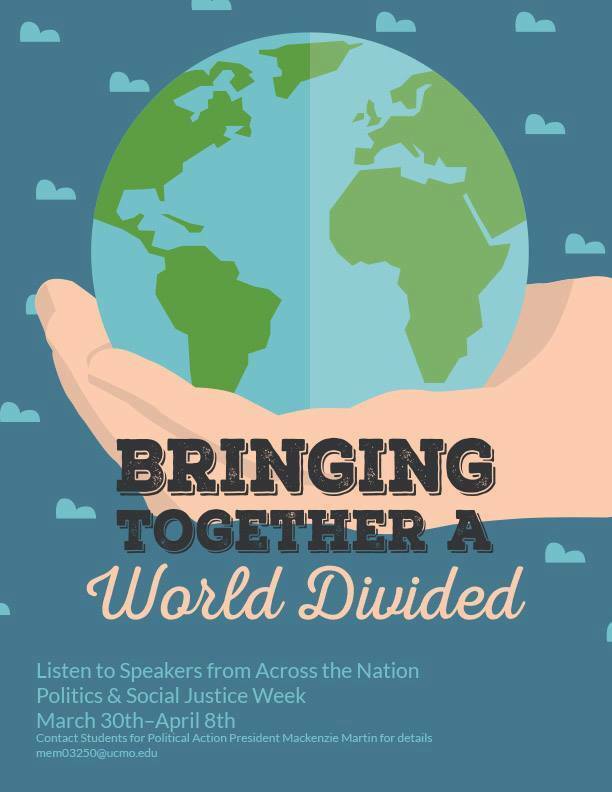 Both Streich and Khulmann agreed one of the main benefits of Politics and Social Justice Week is that it stimulates conversation on important topics. “I think that it is the start of a discussion, and obviously it would be nice to see people keep talking,” Streich said.